Whoo-wee! These beautiful hot summer weather days are perfect for organizing your garage. You can have the music blaring, enjoy the sunshine, while you pull everything out and see what you have ... maybe find something you had forgotten. "There is just too much stuff. I need to purge." We did more than purge. We set items aside for a garage sale, took a LOAD of items to Goodwill for donation, and found a few treasures. Even some items that had not been opened from the boxes delivered. My car was loaded with items. After we unloaded everything, I took a picture of the items Kim was donating. It is a good idea to have a snapshot of items you donate. No need for every shirt, plate, and nick-nack donated. We then returned and continued to dust off the shelves, sweep the floor, clean a garage closet and sort through boxes of Christmas items. Kim was so excited she was going to be able to get her car into the garage without worry about banging into items. Plus, she has all her garage sale items in one area ready to be sold. AND, she can now make paninis with her griddle and fresh juice from her juicer. Items she purchased but the boxes were lost. Great, fun HOT pre-summer day!! What have you purchased but never used? "Charlie and Sandra" moved into their new senior villa about 8 months ago. Like many times, the move was very quick due to declining health reasons. Charlie and Sandra were unable to prepare or move themselves, and their family was unavailable. They relied on hired movers to pack and get their items to their new home. Eight months have past and Charlie and Sandra still have a garage packed with items that have never been unpacked. Some items are keepsakes and collections lost amid the piles. Both Charlie and Sandra use motorized scooters to get around, and all these boxes make it quite challenging. There are paths for them, though ideally these things need to be sorted and removed. This was going to be another dirty job. Thought I would snap a shot of me in action - Bandana, respirator and ready to get messy. Some people think I'm crazy for doing these really gross projects, and this one was right up there with the best of the worst ones. Then Charlie returns home after lunch, sees the amazing progress made in his garage and he begins to cry a bit. He tells me a bit of his story, how thankful he is for the amazing life he has had to date and the frustration he is beginning to feel for the loss of his wife whose dementia is becoming quite advanced. At this point, I begin to forget all the nastiness of my job and I am thankful for being able to make a huge impact in Charlie's life. His garage is cleaned out, keepsakes found and collections safely stored. The majority of items and boxes were damaged and needed to be trashed. Those things that could be used were donated and three crates of canned goods will be taken to Cherry St Mission, a local food bank. "I must be nuts for getting involved in this." Though now looking back, it's projects like this that truly make me realized why I do what I do: Helping people feel better about life. I love helping you organize your homes and lives, though my ultimate goal is to make your day brighter and happier. Thank you John Lennon for "Imagine." Thank you U2 for "One." Challenge yourself to make the day brighter for someone. If hugging isn't your thing, perhaps a beautiful compliment or simply hold the door open. By making a stranger's day shine, you shine too. 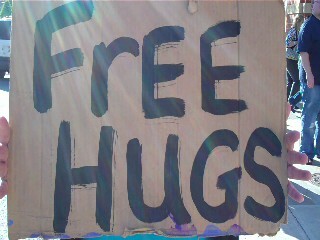 Check out our first Free Hugs Toledo video . When was the last time you hugged a stranger? 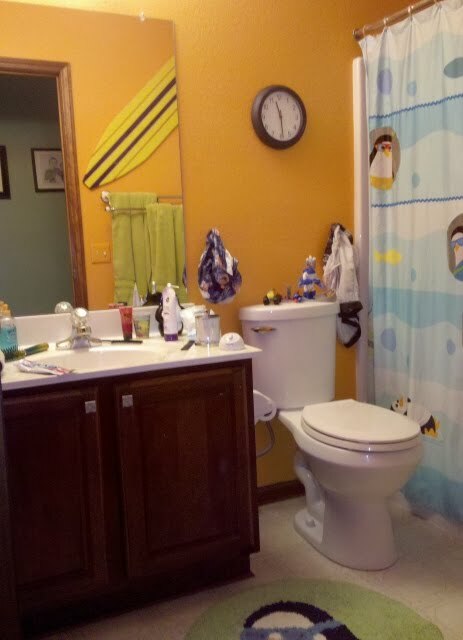 It's likely you walk into your bathroom at least twice a day. It may be a small room, but it is quite mighty in function and need. With its grand responsibiliy, it too needs to be organized. 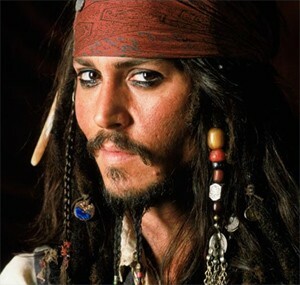 Your items are scattered about on the countertop, waiting to handle your dry skin, make your hair shine, whiten your teeth and avoid that embarrassing wetspot under your arms. All those items are ready for action, though at times you grab one and 2 others begin to tumble over, knocking over your toothbrush into the toilet and ... well, big bummer start to your day. Jeffrey and Michael had just too much stuff scattered about on the countertop. The boys were constantly knocking items all over the place. Sure there was LOTS of space under the sink, but that would require them to open a door, bend over and search for the toothpaste, hair gels, then all of these steps in reverse to get items put away ... Yeah, right! 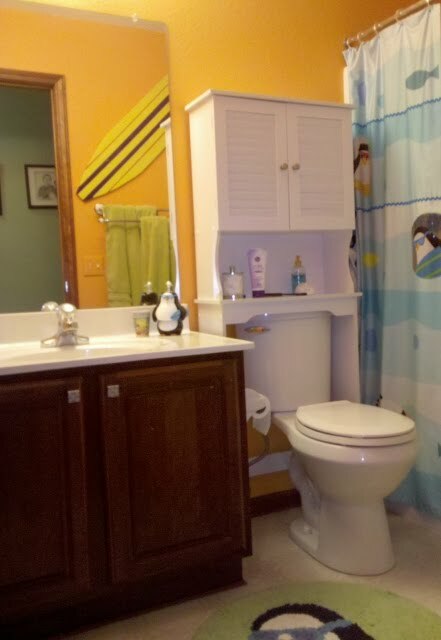 Now, there is the risk of items falling into the toilet with the cabinet. Though, the boys' mom was already an experienced bathroom fisherman with the items tumbling off the countertop. And I am happy to report that there have been no fishing incidences in the past month (hooray). If you're looking to get your bathroom a bit more organized, think about an over the toilet shelving unit. The one pictured was purchased at Bed, Bath & Beyond for under $50 with BBB famous 20% off coupon. Sweet! 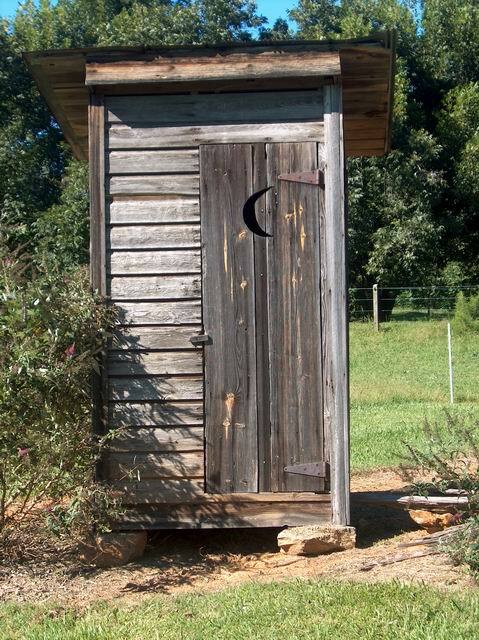 What have you had to "fish" out of your toilet? 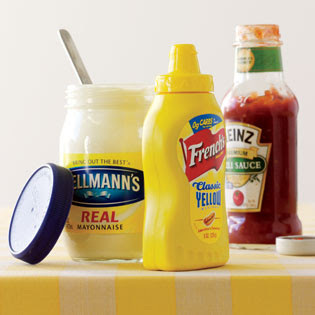 In celebration of the fabulous celebration of Cinco De Mayo, it is time to organize your condiments! For some reason, I have this idea in my head that mustard keeps forever. Yeah ... me, the organized one may have a thing of mustard on the bottom shelf of my fridge from 2007. MAYONNAISE: is good for two to three months if not opened. If opened, it is good for two months in the fridge. KETCHUP: This will last for one year unopened and eight to twelve months opened in the fridge. If opened and kept at room temperature in the pantry, the shelf life drops to 1 month. MUSTARD: Mustard holds up pretty well. It is good for two years unopened. Once open, its shelf life is six to eight months in the fridge or the pantry. JAM, JELLY & PRESERVES: Store these unopened for up to one year. In the fridge, they will store opened for one year. SALAD DRESSING: Up to two years unopened, though once you break the seal 9 months, if kept in the fridge. MAPLE SYRUP: Only thing I could find is 1 year after opening. Mine usually doesn't last more than a couple months. HALF & HALF: Store it unopened in the fridge for up to four weeks. Once it is opened, its shelf life is only one week! Anyone else need to start buying the smaller carton? I thought I was being frugal by buying the larger size that will last a couple weeks. Live and learn. SOY SAUCE: Store unopened for about 1 year. Three to six months once opened, and yeah, you are suppose to refrigerated it. As a rule of thumb, condiments that have a higher sugar and salt content stay fresh longer and have a longer shelf life. And if there is no expiration date on the package, just use this rule: "When in doubt, throw it out." How old is your mustard?